After an early morning dash to my local fabric store for my new favorite Amy Butler Love print, I did however manage to piece together the backing. This quilt is now ready for basting! I love it, thanks for showing more of the quilt. Did you do rows with random strips? However you did it, It looks fab. Rita, you are the master of mixing prints and colors! This is so lovely and fresh! And I am dead curious, did you use three or more different widths of those columns? Amazing! I think this one is my favourite one of yours so far! Oh that's amazing. I've been studying and had an exam and missed a day of checking blogs. I saw this post and thought I recognised the layout....scrolled down a ohh lah lah ....one of my favourite books (another of my night time reading stash!!!). This is a gorgeous interpretation. Well done Rita! Upside down, back to front, inside out...still looks perfect. What a great quilt! I love that the strips are different sizes. Rita - LOVE both of those quilt tops! Is the common factor in the 1st top that all the fabrics must have white or creme in them? Otherwise, I could have never come up with such a diverse combination! It looks awesome! And I received your little package of green fabric in the mail - THANK YOU so much! They're all fabulous! Hopefully you got mine as well. I love the pattern and the fabric choices! 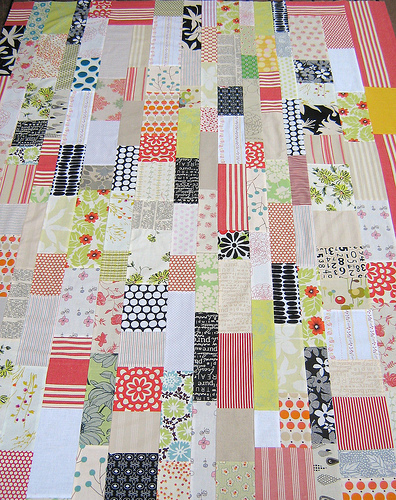 I just found you blog and WOW I love your quilts! Such beautiful fabric choices! I am new to quilting and I love your tutorial on binding! Off to drool again! Love it...have you done a funky border there? Did I see that right? Oooh, yummy! I love the touches of b&w! What a fantastic look! I really love this one. I love it - what a stunning quilt - I can't wait to see the whole quilt, the border looks fabulous. This is so beautiful ... what a great way to use up leftovers. I'm storing this up for later. What a beautiful color scheme, Rita! Love your fabric choices!! I love it. 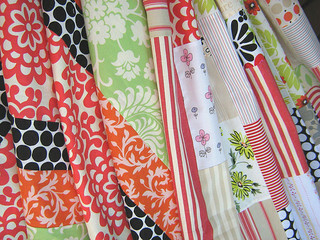 The pattern you came up with and the fabrics are just darling. i love the colours/fabric combo.